"The worldâ€™s tallest building is on fire. You are there on the 135th floor .Â .Â . no way down .Â .Â . no way out." Set in a roughly 24 hour period, the film takes place in and around San Francisco's fictional "Glass Tower," famous even before its opening for being "the world's tallest building" at 138 stories. Intended as a combination retail/residential/office complex, the Tower is about to have its gala grand opening, but its architect, Doug Roberts (Paul Newman) isn't happy. He accuses oily electrical engineer Roger Simmons (Richard Chamberlain) of saving money by installing a sub-par electrical system. Simmons denies this, but as the characters argue, the film's audience can see fire break out in the electrical panel and begin to spread through the building as various characters and their soap opera plots (will Newman and Faye Dunaway reconcile? Will Fred Astaire be exposed as a con artist?) prepare for the black tie event they'll all become trapped at. While some characters will behave heroically and others cravenly, ultimately it will be up to fire chief Michael O'Halloran (Steve McQueen) and his brave crew to save the day in literally explosive fashion. 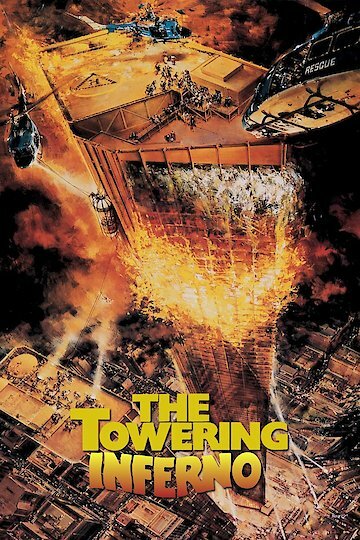 The Towering Inferno is currently available to watch and stream, buy on demand at Amazon, Vudu, Google Play, FandangoNow, iTunes, YouTube VOD online.